The SnapShot took place on August 1, 2018, on Bitshares Block 29222369 at 2018-08-01 03:18:51 UTC. 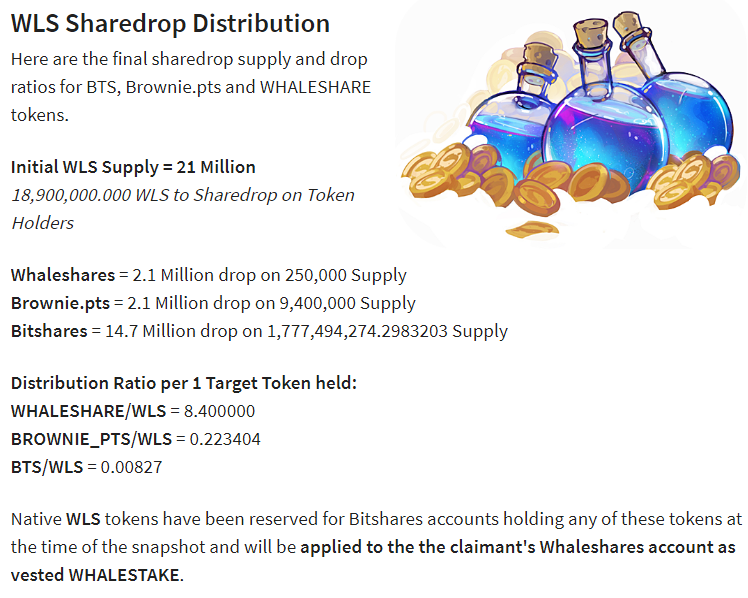 If your BitShares account(s) held BTS, WHALESHARE, or BROWNIE.PTS tokens BEFORE that time, you are eligible for the WLS drop! 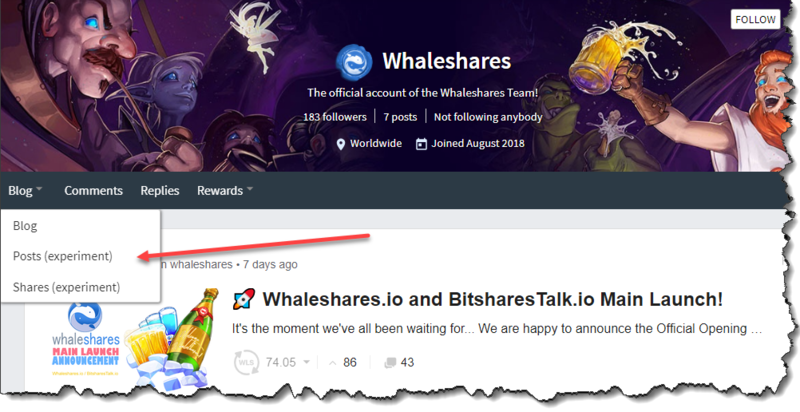 Link: 🚀 Whaleshares.io and BitsharesTalk.io Main Launch! Dance and Feel Free to Be Your "Best Self"! As such, you're welcome to civilly and respectfully express yourself any way you'd like on Whaleshares. You're also encouraged to cross-post content you created to both Whaleshares and STEEM. 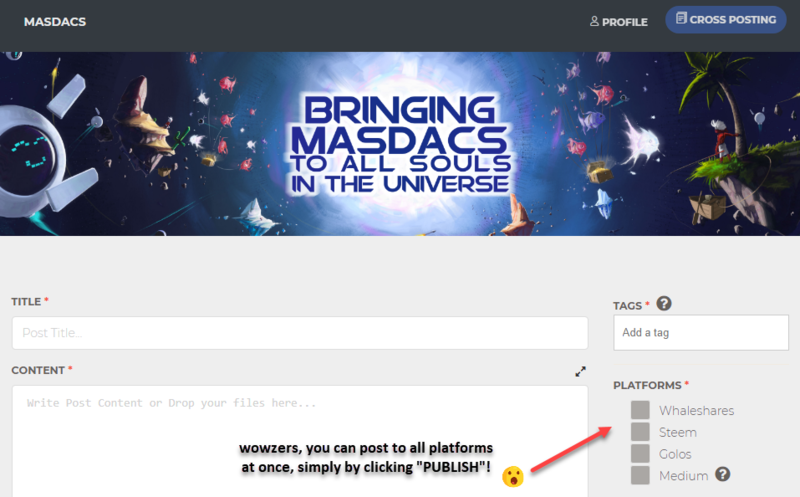 There's even a tool called MASDACS that helps automate the process for you! That leads to another big change on the platform. If you believe a post is worth rewarding, then it should also be worth sharing with your circle as well! So on Whaleshares, when you REWARD, you also SHARE. Pretty cool, ay? There are no megawhales 🐋 on Whaleshares like you may have encountered on STEEMIT, and there is no delegation to create even more megawhale-type users either. Currently, the largest "whales" you might encounter on Whaleshares may hold around 1% of the initial 21 Million WLS Supply. This is another reason it will be much more difficult for any one person to censor others, or to control who is considered "worthy" of receiving rewards from the reward-pool. On Whaleshares, everyone's more or less starting out on equal footing, and will have a chance to be rewarded as such. Furthermore, as an alternative to delegation, and in order to create a stable, long-term economy, larger stake holders are encouraged to further build their WHALESTAKE to back community support WhaleTokens. Not only can these WhaleTokens be used to further reward great user shares, but they can also be used to support and finance other valuable community initiatives and projects as well. Rise up to be a great community member, and you just may have the chance to increase your own WHALESTAKE enough to have your own SMT-style token, and also start supporting your own projects and initiatives! 🚪 I WANT IN, WHAT CAN I DO?! Well, here's another area that Whaleshares vastly differs. No funds were raised to build it, and there was NO ICO to buy into! This "grassroots effort" was completely community driven, supported, and financed. Except for the 10% going to the project development team (which currently has little real-world value until people begin to establish a value for it on BitShares sometime in October), the rest is being dropped onto the BitShares, Brownie Points, and Whaleshares communities, which also consist of many respected STEEM users as well. At the end of the day, just like with STEEM, the only thing that will really bring value to this new chain and token is you, the community, and what you all bring to it. So, at this point, there really is no way for people to just "BUY IN", besides just creating an account, and hitting the ground running by "sharing" with the community! HOWEVER, if you do already have a bitshares account, and are pretty sure you have a bit of WHALESTAKE to claim (even if you held 5 BTS in your account before August 1st, you have enough to claim), it'll cost you 1 WHALESHARE (currently, costing about 1 BTS, or U.S. 10 cents). If you still haven't signed up for a bitshares account (Dan Larimer's first crypto project before STEEM), CLICK HERE to create a new one for free. BitShares is a decentralized crypto exchange. As such, I'm quite sure you'll find it to be another powerful tool in your crypto "arsenal", especially as compared to centralized exchanges. BUT WHAT ABOUT THE REST OF US STEEMIANS?! Well, here's the really great part. 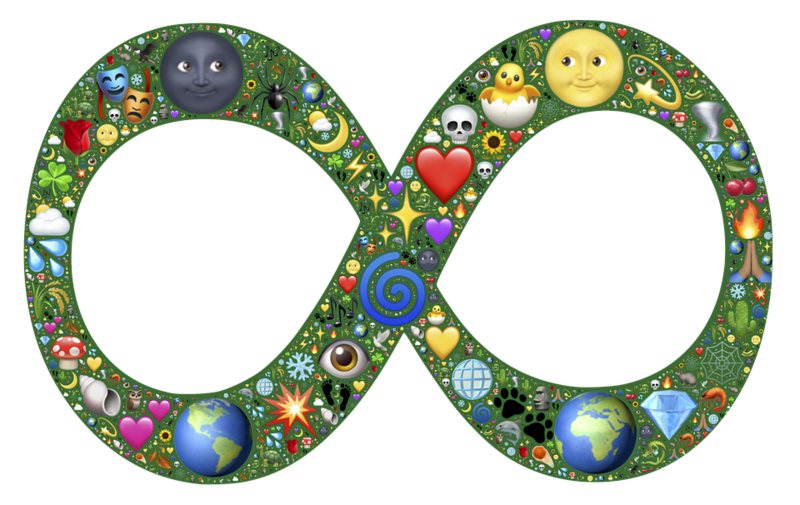 I've come across many amazing, kind-hearted and talented people during my time here on STEEMIT. As such, I'm in a bit of a position to help "pay it forward" in some small degree, and I welcome you to reach out to me on discord (also @alexpmorris), as I just may be able to hook you up with some WHALESHARE tokens (and possibly even a bit of WHALESTAKE) to help you along so you can hit the ground running. Each BitShares account can only claim the sharedrop to ONE Whaleshares account. If you have multiple BitShares accounts, if you'd like, they can all claim to the same Whaleshares account. Finally, if you think you might benefit from a quick video walkthrough on how to create or claim your new Whaleshares account, click here to check out Candi's excellent video tutorial! Also, be sure to join the Whaleshares Official Discord and introduce yourself to others in the community if you haven't done so already. There are many other people there willing to help you if you run into any stumbling blocks along the way! As always, I appreciate your upvote, your follow and all your comments!